Just in time for the 2014 World Cup, the new Grand Rapids Football Club takes off with a bang, reaching its membership goal even sooner than expected. Anya Zentmeyer talks with the people behind the project and finds out there are some passionate fans looking to bring semi-pro soccer to West Michigan. Matt Roberts remembers the exact moment he realized how much potential Grand Rapids has for its own semi-professional soccer league. 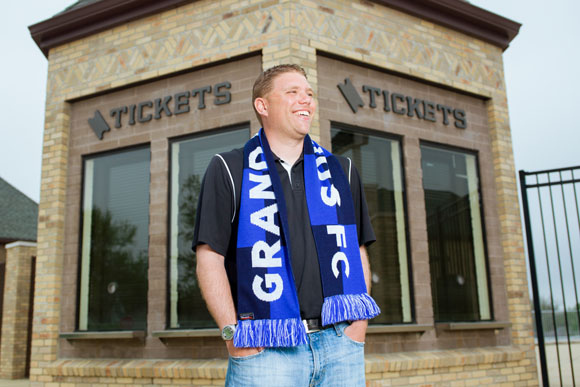 It is the brand new Grand Rapids Football Club and Roberts is its founder. Roberts, a soccer coach by trade, works as the Director of Youth Programs at Grand Rapids Juniors Crew and is part of what turns out to be a surprisingly big fan base for semi-pro soccer in West Michigan. 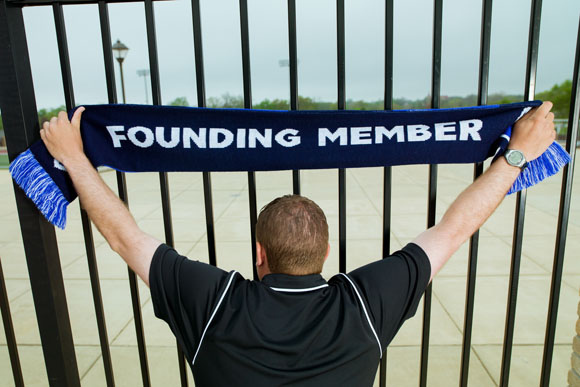 The crowd funding campaign initially kicked off March 17, but more than 250 people have already bought in to GRFC for at least $100, so Roberts has a new game plan: get 500 members by Aug. 1 and go into the clubs first year with a sound $50,000 operating budget in place. GRFC will buy into the National Premier Soccer League for $12,500, and as an official league of its own in the Great Lakes West Conference, will join existing teams in Detroit, Cincinnati and Lansing. Nationally speaking, there are 78 teams in the NPSL for the 2015 summer season. Matt RobertsHe wants GRFC to be a true grassroots effort – by the people, for the people – and has garnered support of some local businesses and business owners including Gazelle Sports, 616 Dental Studios, Wordhouse Wealth Coaching and the SpeakEZ Lounge. Just before the first game of the 2014 FIFA World Cup on June 12, Albertson hosted a World Cup kickoff event last weekend that doubled as the launch/fundraising party for GRFC. They had to move the GRFC part of the event up about a month earlier than originally planned, he says, because of the overwhelming support GRFC has gotten from soccer fans in Grand Rapids. Albertson opened the SpeakEZ Lounge at 600 Monroe Avenue NW opened its doors two years ago with soccer on his mind. Since then, the crowd of soccer fan regulars has only grown. When the World Cup officially begins with Brazil and Croatia on June 12 all of the way through the final game, Albertson says the SpeakEZ Lounge will be “soccer central.” The bar reached capacity for the kickoff event and fundraising party Saturday night, drawing in jerseys not only of the U.S. fans there to watch the final Nigeria vs. U.S. friendly, but also from Australia, Germany, Brazil, Ghana and more. Albertson said every match will be on their TVs with surround sound for patrons for the duration of the World Cup, but if you want a good view, he suggests getting their early. So as the World Cup generates more national buzz and local business for bar owners like Albertson, GRFC and Roberts will spend the next eight months creating the local buzz for their own team, heading into a busy planning phase that entails scouting players, hiring staff and locking down a location. Right now, Roberts has a hopeful eye on Houseman Field in downtown Grand Rapids to host the team. He is currently in some pretty optimistic talks with GRPS, who own the recently renovated stadium. The 10,000-seat stadium underwent a $6 million facelift with leftover funds from a 2004 facilities improvement bond allocated by GRPS’ Board of Education in October 2008. With new turf, technology upgrades, a new press box, concession and restroom facilities, the new Houseman Field reopened in August 2009. He hopes than as the organization continues to grow, so will their status as a legitimate minor league option. In 10 years' time, he wants GRFC to have its own stadium and a regional following that is on par with the Griffins or Whitecaps. If the excitement already generated around GRFC is any indicator, that dream doesn’t seem so far away. Anya Zentmeyer is freelance reporter in Grand Rapids and West Michigan. She can be reached at anya.zentmeyer@gmail.com or visit her website at anyazentmeyer.squarespace.com.